Chelates are chemical compounds in which metal molecule, i.e., mineral is combined with an organic molecule also known as a ligand by binding to at least two binding sites of the mineral through co-ordinate bonding or dative covalent bonding making the whole molecule organic in nature. Chelated minerals are basically organic forms of essential trace minerals such as magnesium, calcium, iron, zinc, chromium etc. in which the chelation is done by using a chelating agent like amino acids, proteinate, and polysaccharide complexes. Chelated minerals are better absorbed by animal and humans than the inorganic minerals, hence lower concentration can be used to achieve optimal bioavailability of the targeted mineral which helps in saving the overall cost of the product and also more effective which is anticipated to drive the market over the forecast period. Inorganic trace minerals have a bad reputation in the animal feed industry as they have lower bioavailability thus poor retention rate resulting in higher excretion rate which can also cause environmental hazards, may form insoluble complexes with other supplements thus resulting in lower absorption rate and they have a higher incidence of metal contamination. Chelated minerals overcome all these issues as they have higher bioavailability thus having a higher stability, lower incidence of metal contamination which has meteorically increased the demand of chelated minerals over the past few years and is anticipated to have a robust growth in near future. In addition, apart from surging demand of chelated minerals in animal nutrition, there is also a hike in traction of chelated minerals as dietary supplements for human nutrition attributed to increasing health consciousness. Many manufacturers are promoting these products as more easily used by the body (more bioavailable) than non-chelated minerals. Almost all of the chelated minerals available for human consumption are based on amino acids (glycine) as a chelating agent as they are smaller in size and stable which makes it easier to be picked by protein receptor in the process of digestion, making it more bioavailable than rest of its counterparts namely polysaccharide complexes and proteinate which is anticipated to the drive the growth of the segment thus supplementing the growth of global chelated minerals market over the forecast period. In addition, key players are also offering custom solutions to their clients depending on the application by combining various blends of chelated minerals which is also causing a positive momentum for the growth of global chelated minerals market. As economies of Asian countries are getting more stronger, the median income of middle class has increased substantially which has resulted in better quality of life thus demand for meat in the region has skyrocketed which can be seen in the below graph in which overall meat production of Asia has surpassed all other regions. 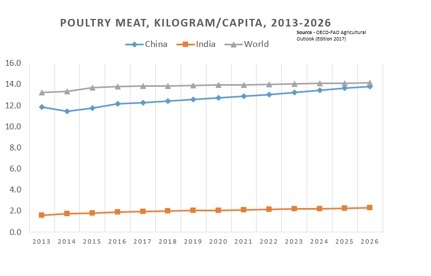 The second graph shows the per capita consumption of poultry meat in China, India and the Word, here also, the per capita consumption is forecasted with a positive growth. 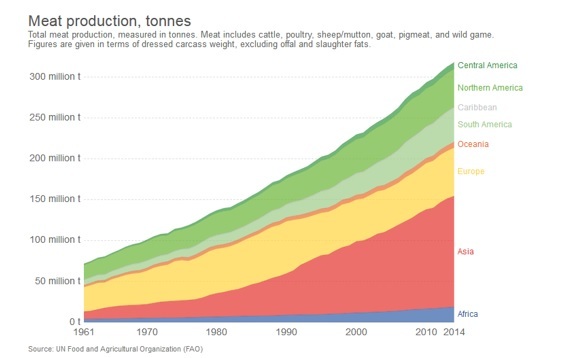 The surging demand for meat and poultry products has created stress to increase the yield of the byproduct of livestock. These factors have resulted in enhanced demand for high-quality animal feed which is anticipated to drive the growth of chelated minerals. Chelated minerals offer multitudes of benefits such as an increase in immune response, milk output, improved milk and egg quality, and high feed conversion ratio which making chelated minerals to have an omnipresence in the compound feed. Moreover, increasing shelf visibility, consumer awareness, media promotions etc. have increased the traction of chelated minerals as a dietary supplement for human consumption and is expected to have a sound growth in the developed regions such as North America and Europe. Increasing awareness towards health has become universal thus more and more consumers are engaging in getting information about the ingredient that they incorporate in their daily life, chelated minerals are far more superior than inorganic trace mineral and have a lucrative opportunity in the developed market as they have created a positive buzz about their effectiveness in the dietary supplement industry. Manufacturers can also leverage the increasing market potential of chelated minerals in animal feed in developing region especially, Asia where demand for high-quality meat and poultry products is immensely increasing creating a huge white space for chelated minerals manufacturers to invest for expansion.